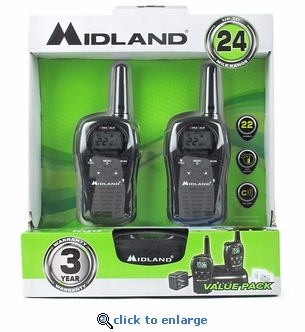 This pair of Midland LXT500 rechargeable two-way radios, featuring 22 channels and a 24 mile range, are built tough for on the job and reliable for communicating with family and friends in an emergency. The LXT500 walkie talkie radios offer clear and crisp communications at an affordable price. Power the two-way radios with either the rechargeable NiMH battery pack or 4 AAA alkaline batteries (not included).